Phyllis Jean Newsletter, Issue #001 -- More Colors! More Improvements, More to See! We are offering free shipping to all our subscribers. Read on and find the code! --Website Info: Robby (our website specialist) updates us on the latest website stuff, and answers some questions. by Marian Therese Horvat, Ph.D.
“First, the wearing of men's dress by women affects the woman herself, by changing the feminine psychology proper to women; second, it affects the woman as wife of her husband, by tending to vitiate relationships between the sexes; and third, it affects the woman as mother of her children by harming her dignity in her children's eyes . . . This changing of the feminine psychology does fundamental, and, in the long run, irreparable damage to the family, to conjugal fidelity, to human affections and to human society." Today we are witnesses of that "fundamental and irreparable damage" that the Cardinal warned would happen with the changing of the feminine psychology. In passing, I mention here a subject that could be analyzed in another article: In the trail of the masculinization of women came the feminization of men. As women usurped the headship of the family, relationships in the entire family were disoriented. Children were deprived of their natural role models and confusion followed. Both sexes suffered a loss of identity. At the university where I taught, I was constantly shocked to see how much effort and time was given over to the discussion of "what it means to be a man" and "what it means to be a woman." These would be moot points for these youths' grandparents, who would be amazed to see so much high level academic discussion about such evident first principles. Well we have been working hard to continue to offer new innovative ways to make our website fun and exciting! We have been adding more content to our pages. On our "skirts" and "blouses" pages we have added more readable information so that you may be more informed on what we offer. On some pages we have also added a few new articles written by Jen, our PR lady, that are slightly related to clothing, but more directed to you. The first new article is about Closet Clutter! Read it by clicking below. We have also added a whole new page. Along with it is more great info for everyone's upcoming HOT summer months. Take a look by clicking below and enjoy! This was a question asked last month and so I updated all of our pages. Now on every page you will have a price located in the section you are looking at. So for example, if you are looking at 10 Gore Denim Skirts, the prices are located in the size chart. Some items have the prices right next to the picture, others have them in the size chart. We will also be starting a new poll so look for that! That's it from me, the Website Specialist. This was a lot of fun! We got some great feed back...and even better we had a tie! So instead of figuring out a tie breaker, we thought you might enjoy getting both colors! Actually as of writing this we had a late submission that was the tie breaker and Number 4 is the winner...but what fun is it getting only one new color?! The two new skirt colors will be available shortly. We work with a factory in Sacramento that does the dieing for us. So as soon as they pick them up and send them back we will have them available for you on the internet! All orders over $50 get free shipping! Sale Ends July 16th. We have a new skirt for you! It is a 10 Gore, 100% cotton skirt. This will be up as soon as our Website Specialist gets some time. Here is a sneak peak at our new skirt which will hopefully be up and available this week. 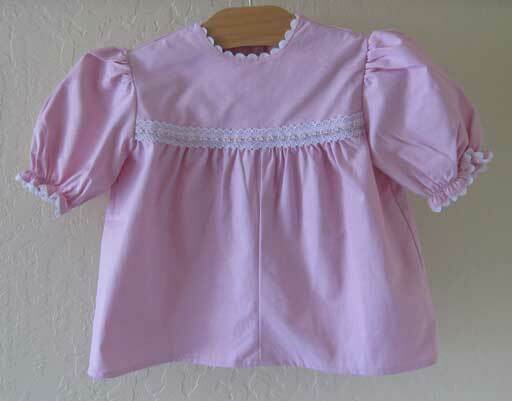 We have a lovely new little girl blouse available soon (should be up about the same time as the new cotton skirt!) These are so cute underneath a denim jumper...I think I know where to get one of those! Click here to go to our store. Thank you all for subscribing and we will see you again next month.